Manage certificates as proof of completion. Training records are always easily available. Deliver all your courses online, no need to book rooms or book training instructors. Track compliance in real-time, stay in control of critical training. Easy scheduling tool makes it easy to organise training. Integrate your HR management system or manage users directly with the user administration panel. Train on your phone, tablet or computer at a time that suits the business rather than the training instructor. Who are One World Learning? Engage your employees with the best eLearning solutions. Fast track your training programme and know exactly who is trained, what assessment score was achieved and who needs to be trained - all visibile from your computer, in real time. 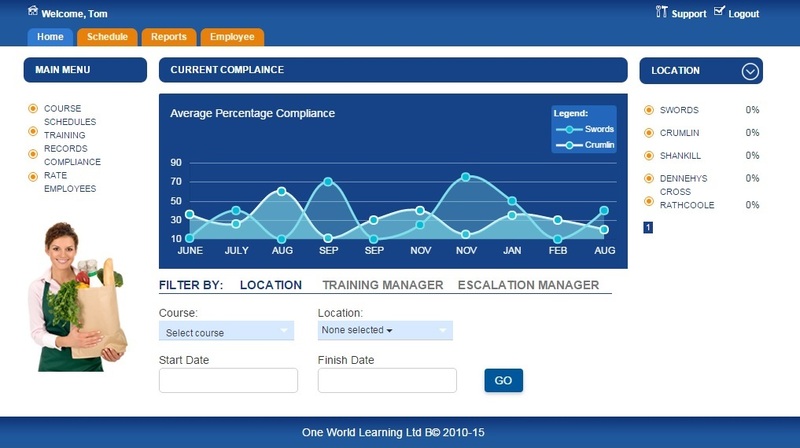 Our training solutions engage your staff, our learning management system tracks your training. It has never been easier to move your training online. We are here to help - talk to us now. Call us today for a Free Consultation on how you can move all training online for easy delivery and management. 40% - 60% less training time to cover the same material. According to a study by Brandon Hall, e-learning is more effiient than traditional classroom training. People can cover the same material in 40 -60% less time. This finding is supported by IBM who found they could increase the amount of material to be covered in training by almost 5 fold without increasing the training time allowed. They discovered that every dollar invested in elearning resulted in $30 increase in productivity. Call us today and learn how you can move training online. Improved retention of training material! According to the Research Institute of America, retention increases by 25% to 60% when participants use elearning. This is understandable when you remember that elearning gives people complete control of the pace of the course and allows them to study at a time that suits their schedule. Who buys from One World Learning?